If you’ve been reading my blog, you know that I’m looking into gyrfalcon predation of ptarmigan in Alaska. So far, my data successfully shows that ptarmigan are avoiding locations where gyrfalcons are densely packed – which makes sense; you wouldn’t beeline to set up camp in a lion’s den. But here’s the problem: ptarmigan don’t show up in every location where there are no gyrfalcons, only in some of the locations. There are plenty of places across my study site where there are no gyrfalcons AND no ptarmigan. Normally, we would think this was due to some environmental variable, like vegetation prevalence. But in this case, every variable I tested – vegetation, elevation, shrub cover, etc. – came up with nothing. It made no sense! There were many late nights where I sat staring at my computer screen, desperately trying to think of something I’d missed. Why were ptarmigan choosing some places without gyrfalcons over others? Was there an element of the landscape of fear that I had missed? If I stared at my computer long enough, would it take pity on me and do all the calculations itself? So I went back to the literature, looking for something in prior research that I had missed. That’s when I saw something interesting: gyrfalcons like to use “slope soaring,” a pattern where wind hits a mountain and is deflected up and over the slope. In turn, the falcons use this wind behavior to come barreling over the slope and ambush ptarmigan, using the higher elevation for a few extra seconds of cover before they are spotted by prey. Ptarmigan are actually better fliers over longer distances – if they make it past the first few seconds of an ambush, their chance of surviving the entire attack is much higher. 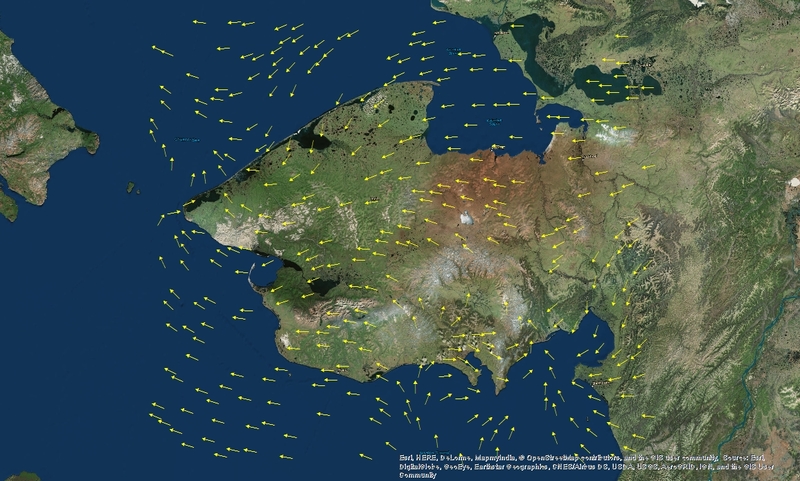 I went online and grabbed all the data I could find on wind direction across my study site, taking historical data from eight different weather stations. I then created a map of average wind direction across the site using ArcGIS. I compared the angle of wind direction to terrain aspect (the compass direction of a slope – basically, does this side of a mountain face north, east, etc.? ), and then compared that information to where I observed ptarmigan. As it turns out, anywhere that wind direction runs downslope and allows gyrfalcons to perform slope soaring has no ptarmigan. On the other hand, ptarmigan were staying in places where wind blows perpendicularly to a slope or upslope! This means that ptarmigan were intentionally positioning themselves so that wind made life difficult for an attacking gyrfalcon. Crosswinds would make it harder for a gyrfalcon to attack in a straight line, while wind blowing uphill makes it more difficult for a gyrfalcon to successfully use slope soaring in an ambush. This means that the organization of the landscape of fear had nothing to do with vegetation! Instead, it has to do with WIND. I was stunned…and ecstatic. I’ve never heard of this kind of thing happening before. A quick search through the literature shows this as a totally unstudied topic.